As I left the comfort and wonderful aroma of my grandmother’s kitchen this past weekend, she approached me with a large Sketcher’s shoebox. “This should last you a few weeks at least,” she said. Trying for the life of me to remember the last time I put on tennis shoes, I slowly opened the lid, and there, like perfect tin soldiers, were rows of her preserved figs and strawberry figs. “Oh this should last for at least that amount of time,” I said as I began ruminating of places to hide the coveted jars. Vegetable drawer, behind jars of roux, seasoning cabinet, cookie jar, above the refrigerator… I can be quite wily with her preserves. They sustain me, so therefore they must be hidden. On our trek back to Birmingham, we stopped in the ever beautiful and steamy city of New Orleans. Walking around the streets of New Orleans in July is a lot like being trapped in a sauna with a keg of beer. The moist air clings to your skin and the smell of booze piggybacks. There are few things in the world that could tempt me to be a peach in moments like this, but the smell of crêpes being made on a small, endearing cart on the sidewalk has the power to make me forget the fact that I am damp from head to toe. Then, it came to me. I wonder if I could sneak some of Grandma’s preserves into a crêpe without anyone noticing? If no one had noticed the 2-pound Mason jar I was carrying in my purse, maybe they would not notice me cracking open the jar of her sweet, sticky, red preserves. I asked for a plain crêpe and whenever everyone ordered theirs, I quickly smeared some of the red preserves onto the pancake. The process was quick and messy. It resulted in a half opened jar of preserves in the bottom of my purse, staining everything in its path. The reward outweighed the sacrifice. I began walking the streets of New Orleans with pep in my step, dripping sweat, and a curiously stained smile while I devoured my wonderfully “plain” crêpe. Notes: I am using my grandmother’s strawberry figs in this recipe, but you can use peach, strawberry, blackberry…. whatever you are craving! Place a nonstick skillet on medium to medium-low heat. Brush butter onto the pan. With the batter in one hand and the hot skillet in the other, slowly pour the batter into the pan and twirl the skillet in the other so that there is enough batter to purely coat the bottom of the pan. 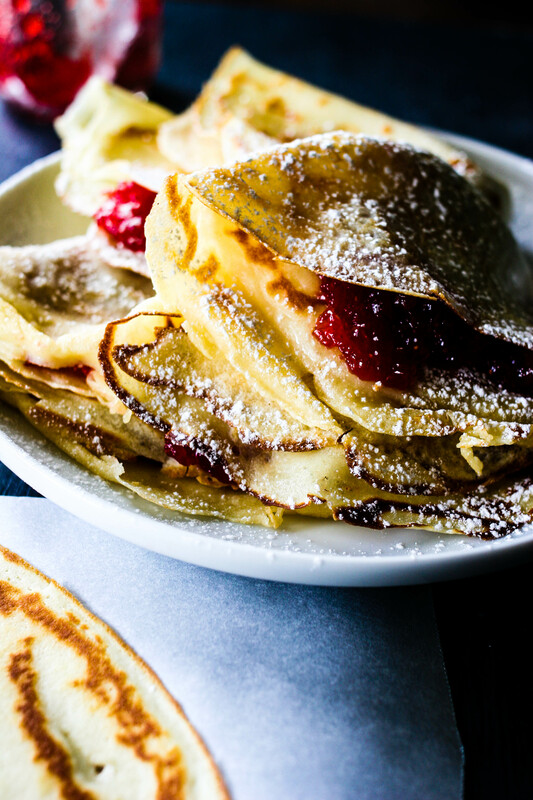 Let the crêpe cook just until brown, flip with a spatula and brown on the other side. Flip onto a plate and continue with the remaining batter. I usually end up with 6, but depending on the size of your skillet, you may end up with one or two more or less. 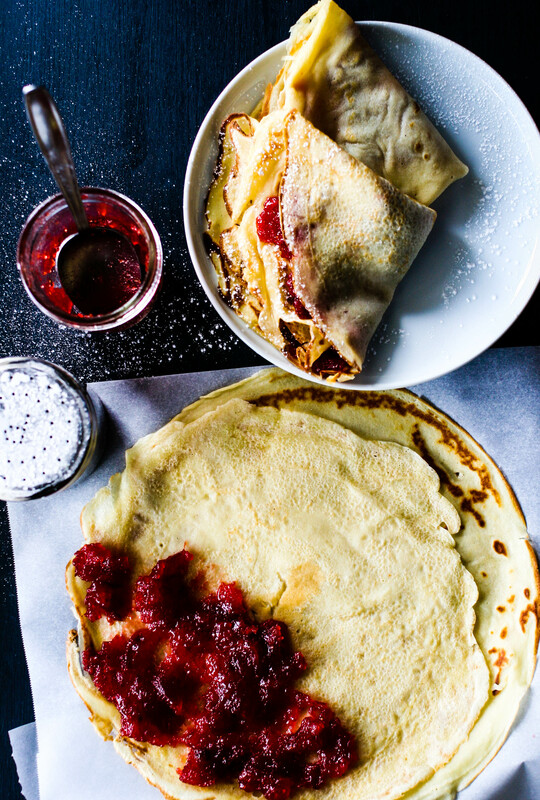 Fill half of the crêpe with the filling of your choice and fold the crêpe over itself twice. I had to save you one, of course! Happy you liked them! Ha! I was happy because I thought they would be so terrible to make and difficult but I was in such a good mood because they were faster to make than pancakes! We’ve been eating fresh figs and making fig preserves the past few weeks from our fig tree (not bad considering we are up north in Ohio.) the strawberry figs sound delicious – would your grandmother mind you sharing her recipe? Aw how fun! The only problem with Cajun cooks is that they normally don’t use recipes, and my grandmother is no exception! To get the recipe, I would have to stand over her shoulder taking notes and measuring everything when she isn’t looking!